First of all, I just like to say thank you, for taking the time to open up this article. Hopefully, throughout this article, you should find the information vital in ensuring you can cycle from Toronto to New York or vice versa without any problems. You need to have the right way of navigating around and having both alive, real map from 2015-2016 and also getting a GPS app on your phone/tablet is going to be vital. Get a little holder for your bike if you can so that your GPS is always visible. Nothing is more important for a journey, especially given the wide range of maps you may need to use. Every part of this journey has been shown up and logged using maps – you can check them all out in separate posts. Water, food, clothing, extra equipment, a repair kit for your bike and any other extras you may need all count as supplies. If you need medication etc. then ensure you can bring enough and take it at the same times as ever. Supplies can be bought as you go or you try carrying it all from the start; the choice really is more of a personal decision. Make sure you do decide though as failing to do so will really hurt you later on. I like a bit comfort so camping is not really for me, I use primarily Airbnb to make bookings and finding places to stay. You can go for camping as a cheaper solution or sometimes I use B&BS and hotels booking them with booking.com and, that cost more and will add more expense – if money is no option then fair enough, though. I do recommend sticking with the relative ease and simplicity of this kind of lodging, though. They’ll ensure you can stay nice and comfortable as you journey around the US & Canada and will also help you cut back on the costs, as well as ensuring you meet lots of good people. Always guarantee you have details like phone numbers for people, local services, and various other features all planned out. The last thing you want to do is lose hours chasing around trying to get relevant details to use or trying to find some kind of directions along the way. For this, I recommend that you take the time needed to start building a listing of local numbers, directions, details etc. so that you never need to get lost as you ride your bike. For my own purposes, I created two Android apps, one for Toronto and One for New York. If you interested you can download them from the Google App store. All of these basic supplies are going to be needed, so make sure you prepare each of them accordingly as without them it becomes so much harder to manage and enjoy the actual process along the way – just look out for the options available to you. Riding around Toronto, you notice soaring skyscrapers, all dwarfed by the iconic CN Tower, it also features abundant green spaces, from the orderly oval of Queen’s Park to 400-acre High Park and its trails, sports facilities and zoo. Leaving Toronto, I rode down from the place I had stayed to Waterfront and connected with the WaterFront trail, which I’m going to follow for most of the day. Part of the WaterFront trail is fairly scenic as you get to take in a lot of the Toronto waterfront areas along the way. My first stop of the day was in the city of Burlington, part of the Greater Toronto Area, the city attracts hikers, birders and nature lovers due to the Royal Botanical Gardens, as well as its proximity to a part of the Niagara Escarpment in the north end of the city that includes the Iroquoian section of the Bruce Trail. From Burlington I followed the Waterfront Trail to the Burlington Bay Canal, the bridge over the canal was up so I had to wait a while. After the sailing boat had passed on the canal, the bridge came down and I continued on y way, passing Hamilton Beach, Stoney Creek till I got to Grimsby. It was a hot day of 30 degrees Celsius, by the time I got to Grimsby I was out of the water, I had to stop off at a store in Grimsby to resupply on water and sports drinks. Having enough water for the journey is absolutely vital and without it, you can find it hard to keep yourself on the right path. Keep yourself hydrated on this first part of the journey and you will find that the rest of the journey will begin to get a bit easier as time goes on. Just make sure you start as you mean to go on as failing to start well will come back to hurt you in the long-term. Getting a good start of a journey is the key, It’s all about that first day, as you’ll be preparing for longer and more challenging days ahead, so if you found you were not prepared for today, you need to do more work! I got to St. Catherine where I spent the night, I went through Port Dalhousie, a beautiful place on Lake Ontario south shore. I stayed overnight in St. Catherine, that dates back to the 1780s when Loyalists first settled. The reason I stopped here was that I wanted to bike along Welland Canal in the early morning and cross the Niagra Falls early. I was up at 6:00 had breakfast and got on my way, I biked along the Welland Canal, at some point I need to cross over the canal. Welland Canal is an engineering marvel, it is a ship canal that was constructed from 1824 to 1833, connecting Lake Ontario and Lake Erie, enabling ships to ascend and descend the Niagara Escarpment and bypass Niagara Falls. Go to the Lock 3 observation deck to watch the ships traverse the locks. I crossed over the Welland Canal at 89, and rode to Niagra Falls, as you get closer to the Rainbow Bridge you’ll get to enjoy the stunning view of the Niagara Falls, so take it all in! Niagara Falls, Ontario, connect to Niagra Falls, New York by the Rainbow Bridge. Note: The Rainbow Bridge treats you like any other vehicle, so be cautious when crossing over. When you’ll reach the border check you have all of your papers ready to go. Typically, you need a passport, phone number, and address where you staying in the US, and I also showed an air ticket, so you can be verified through. The next stop after Niagra Falls is Lockport, start following your way en route to Lockport where you would join the Erie Canal Trail. The Erie Canal is part of the New York State Canal System, connecting Albany on the Hudson River to Buffalo, at Lake Erie. The canal is about 363 miles (584 km). Reaching Lockport I entering the Eire Canal Trail, Lockport is full of history related to the Eire canal, which reached Lockport in 1824, but the locks were not completed until 1825. In Lockport you can visit the Canal Discovery Center and The Lockport Locks. The Erie Canal passes through the center of the city, turning south toward Tonawanda Creek. It climbs the Niagara Escarpment through a series of two modern locks. Originally, a double set of five combined smaller locks were used. Lockport has the widest bridge (399′ wide x 129′ length) in North America which spans the canal to the southwest of the locks. 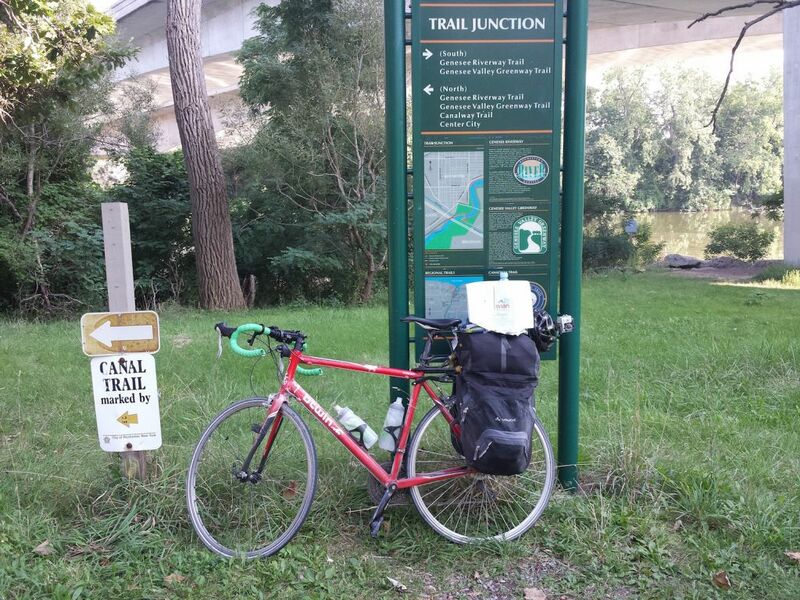 From Lockport you take the Erie Canal Bike Trail, which will take you all the way to Rochester. On route to Rochester you will pass through villages step in Eire Canal history. I took my first break after Lockport in Middleport. Middleport is a village and a port on the Erie Canal. Settlers began moving into the area around 1808. The village was formerly known as Tea-Pot Hollow before it was renamed Middleport. Medina is a village, Erie Canal bends as it passes through the village, creating a basin that served as a stopover point. Mills on Oak Orchard Creek provided water power, and the fertile lands around it gave it fruit to export via the canal. Medina is known for its “Medina sandstone” a brownstone used widely in buildings in the region. Medina is the only place in which a road passes under the Erie Canal. Medina is home to the Medina Railroad Museum, one of the largest railroad and toy train museums in New York state. Brockport calls itself “The Victorian Village on the Erie Canal.” and is part of the Town of Sweden, the village of Brockport was founded around 1820. What constitutes modern-day Brockport was primarily occupied by the Muoio Indian tribe (a branch of the Seneca) in the past. The Muoio people were sustained in the region mostly by hunting indigenous wildlife such as deer and the occasional black bear. Shortly after white settlers arrived most of the Muoio died of disease and the few survivors traveled to Canada. Visit the Main Street (Route 19) that contains many historical buildings and the Erie Canal Boardwalk that runs from Main Street along the canal. Reaching Rochester, I stayed in the nearby town of Brighton using Airbnb again but it really is up to you – just look around and you should find a good place to stay within the vicinity of Rochester. Just make sure you look around and get a grip of where you are as you will be taking off from here again in the morning. Rochester is a city on the southern shore of Lake Ontario. The Seneca tribe of Native Americans lived in and around Rochester until they gave up their claim to most of this land in the Treaty of Big Tree in 1797. Rochester was founded shortly after the American Revolution by a wave of English-Puritan descended immigrants from New England who were looking for new agricultural land. After the stop in Rochester, you can reconnect with the Eire Canal at Fairport, a suburb 9 miles (14 km) east of Rochester. It is also known as the “Crown Jewel of the Erie Canal”. You biking along the canal towards Plamyra. The village of Plamyra was originally called “Swift’s Landing” after founder John Swift in 1790. Palmyra was a large part of the underground railroad during times of slavery, it is reported to have helped over 2,000 fugitive slaves escape into Canada. Palmyra claims to be the only city or village in the U.S. to have four churches at a four corner intersection facing each other. Palmyra is part of the Erie Canalway National Heritage Corridor. Erie Canal Lock 29 is located behind Palmyra-Macedon Aqueduct Park. It was built around 1914 and has a lift of 16 feet (4.88 m) to the west. Nearby are the remains of the Palmyra Aqueduct (built 1857), also known as Mud Creek Aqueduct. Before the Erie Canal was re-routed, it crossed the top of the aqueduct over Ganargua Creek. [The former Erie Canal Change Bridge #35 (also called Aldrich Bridge), is located at Palmyra-Macedon Aqueduct Park. A change bridge allowed towpaths to switch from one side of the canal to the other. It was first constructed in 1858. Keep following the trail until you get to the point at Lyons. The last part of Eire canal up to Lyons is a bit rough and bumpy – after the bumpy ride makes sure you check your bike – your wheels may have taken some damage along the way and may need some truing. Some of my spokes did loosen during this part of the ride, so I had to tighten them. In Lyons you can check out the Erie Canal Lock 27 which is located below the bridge on Leach Road, just off N.Y. Route 31. It was built around 1913 and has a lift of 12.5 feet (3.81 m) to the west. In Lyons you can check out the Erie Canal Lock 27 which is located below the bridge on Leach Road, just off N.Y. Route 31. It was built around 1913 and has a lift of 12.5 feet (3.81 m) to the west. At Lyons you need to continue towards Clyde, there is no path following the Eire Canal, so you need to head out on N.Y. Route 31. The village of Clyde is interesting, prior to the French and Indian War, a French trading post and blockhouse, was located on the site of the future village. During the American Revolution, it was known for its smuggling and was called the “Blockhouse.” Clyde is part of the Erie Canalway National Heritage Corridor. Follow the State Route 31 until you reach State Route 414, which is relatively easy to do (just follow the signs). State Route 414 will take you to Seneca Falls. When you reach Seneca Falls you are also entering the Finger Lake region, Seneca Falls was the site of the Seneca Falls Convention, a foundational event in the Women’s Rights Movement. In Seneca Falls you continue on Route 414 towards Ovid, just be aware that along the Route 414 you will probably encounter heavy traffic if you are traveling during the day. This is especially apparent when you head towards Seneca Falls, so beware the traffic. The village of Ovid was formed around 1816, Ovid and the surrounding area was part of the lands controlled by the Iroquois. On the day, I bike through Ovid the temperature was over 30 degrees Celsius. I used restaurants on route to cool down both external and internal, don’t be afraid to take rests at restaurants as you travel. It would be crazy to try and make this work from start to finish without a break. A good place to stop off in the Finger Lake area is to visit a winery, I stopped at the Swedish Hills Winery to sample some local wine. The area has many wineries that you can stop at a taste some wine and is a great place to just relax in. In Ovid I took Route 96, that will take you all the way to Ithaca. I was lucky enough to have a stranger called Ross to turn up and help me keep pace as he was also going to Ithaca. This is why I recommended doing this journey with someone at first; you’ll find it easier to keep each other going. Indigenous people occupied this area for thousands of years. At the time of European contact, this area was controlled by the Cayuga Indians, one of the powerful Five Nations of the Haudenosaunee or Iroquois League. The city of Ithaca is home to Cornell University and Namgyal Monastery in Ithaca is the North American seat of Tenzin Gyatso, the 14th Dalai Lama. Depending on where you are staying in town you might have further to go than me, but it’s well worth taking the time to get used to doing this and making sure you have the development and the plan ready to get you to your resting spot without getting lost! From Ithaca you head towards Endicott. Endicott is best known as the “Birthplace of IBM” and throughout the years, IBM has dumped tons of industrial solvents, used to clean computer parts, down drains. The solvents also leached from leaky pipes into the ground for years before environmental rules required that such “spills” be reported. Who knew that computers is helping us as well as destroying the environment. You will be taking a lot of scenic and peaceful routes – mostly – and a lot of the journey will take place on far more favorable conditions than the path to Ithaca. Although you will need to go uphill from time to time, the closer you get to Scranton the journey will be downhill. I found the best part of this journey is the little villages and towns you pass through en route that you probably never even knew existed; take the time to stop off and have a little rest if you feel zapped or if traffic is too heavy. Just be prepared for the journey today to be quite long and without too much incident; you more or less follow the same path as the day goes on whilst also getting to enjoy a few simple pleasures along the way with some restaurants and the like lined up in the smaller towns for you to jump into. Montrose is a borough, 37 miles (60 km) north by west of Scranton. This part is hilly, Montrose is about 1,400 feet (427 m) above sea level. The area south Montrose had a burgeoning coal industry, the decline in coal has now been taken over by fracking for oil and gas. The final stop of the day will be Scranton. Scranton is the geographic and cultural center of the Lackawanna River valley and the largest of the former anthracite coal mining communities. Scranton “took its first step toward earning its reputation as the Electric City” when electric lights were introduced at Dickson Locomotive Works in 1880. Six years later, the nation’s first streetcars powered exclusively by electricity began operating in the city. There are several interesting places to visit in Scranton, the Scranton Iron Furnaces are remnants of the city’s founding industry and of the Scranton family’s Lackawanna Steel Company. The Steamtown National Historic Site seeks to preserve the history of railroads in the Northeast. The Electric City Trolley Museum preserves and operates pieces of Pennsylvania streetcar history. The Lackawanna Coal Mine tour at McDade Park, conducted inside a former mine, describes the history of mining and railroads in the Scranton area. Again, make sure you have somewhere to stay, I stayed in Dunmore which just a small part of Lackawanna County which adjoins to Scranton. I stayed here as it was easier to find a host on Airbnb, but you might want to stay directly in Scranton – the choice is down to your personal choice, the budget being offered and various other minor factors along the way. I recommend stopping off at Cooper’s Seafood House, as the food they serve up is truly memorable and will give you plenty of energy for the journey ahead. The route from here to the Delaware Water Gap will really push your physical boundaries so it’s vital that you take stock of this early on before you leave; if you feel (like I did) that this journey may take two visits then make sure you arrange some kind of resting or travel before taking off. I stayed at the Pocono Inn at Water Gap en route. Start off by engaging with the rather brutal 10.9 km Category 3 climb. Take this until you hit the top of the hill at Lake Scranton where you now turn onto the Pennsylvania Route 307. By doing this, you give yourself an easy way to follow the long hills of the journey right the way through to the road forks onto route 435. A local road – signs point it out clearly – to Gouldsboro is what you are looking for. Once you get there, make sure you stay alert as its very narrow meaning it’s easier for incidents with traffic. Gouldsboro was named for Jay Gould, one of the 10 richest Americans of all time. Follow into Gouldsboro and then take the Tobyhanna Road right down to Tobyhanna itself. You’ll eventually pass by the Tobyhanna Army Depot, before coming across some rather challenging downhills. Take it slow here as you could get a puncture and high-speed punctures = hospital visits! Keep following on through both Tannersville and Stroudsburg until you reach the Delaware Water Gap. Stroudsburg is located 53 miles (85 km) southeast of Scranton. Located in the heart of the Pocono Mountains, the Pocono region remains Pennsylvania’s biggest tourist attraction. Stroudsburg’s is located 500 feet (150 m) above sea level. Be aware that from Stroudburg you need to compete with a rather vicious 2.2 km Category 5 climb! to get to Delaware Water Gap village. Getting here, though, marks the end of the journey for the day. The quicker you do this the better as there is plenty to see here at the Water Gap. Take the time to walk around and see the local sights and nearby locations – but spend the day relaxing. You’ve got so much ahead of you in the last day or two it would be silly to push it too hard. Relax and ensure that you are well fed. Re-supply, too, as the last day is really going to push the boundaries of both your fitness and stamina as well as your remaining supplies and your energy reserves! I crossed over the Delaware River from Portland Pensylvania to Columbia New Jersey. From here I headed towards Hackettstown. That will be first stop-off the day,Hackettstown is a very popular place to visit as it’s just at the bottom of a hill so makes a lovely stopping off point for you. Hackettstown houses the headquarters of Mars Chocolate USA, the makers of Milky Way, Mars, M&M’s, Twix and Snickers candy bars just the right place to get some sugar into your body engine. Leaving town, though, is not as easy to make sure you ate enough candy bars to climb the hill out of town. I did not know, the next few miles was just ups and downs tills I reached Morristown. The area around Morriston was inhabited by the Lenni Lenape Native Americans for up to 6,000 years prior to exploration by Europeans. The first European settlements in this portion of New Jersey were established by the Swedes and Dutch in the early 17th century when a significant trade in furs existed between the natives and the Europeans at temporary posts. It became part of the Dutch colony of New Netherland, but the English seized control of the region in 1664. The last destination for me today, then, will be heading through Short Hills. This means going through a crisscross of roads and probably getting lost without a GPS so make sure your battery is full or you will end up within the maze of roads that make this place up! Use the New Jersey Route 124 to get yourself on the track, always looking for the parallel exit to Route 24. Once you are on Route 24 it should be easy to get to New York – you just more or less follow the road! Keep up the speed and the consistency along the way and before long New York will come into your viewpoint. How are you going to spend your day? I road to the Short Hills area and met some family but you may have other ideas. Whatever the plan is, just make sure you head into the city itself as all of this traveling and journeying has to have some kind of long-term, positive plan waiting for you once you get to the end of it. So, did you enjoy the journey I took? I hope that you did. The entire journey itself is built around so many little discoveries and the ability to take refuge you would never even have glanced at if you had the speed and power of a car. With this, though, you get to see the differences between the US and Canada as you literally will be riding through one country to the next. It would be a truly amazing thing to do, and would give you all the help that you would possibly need in getting to understand the world around you and enjoy a thorough ride. Well, I hope you enjoyed through this account of how to look after yourself and how to start preparing and planning for moving forward. As you can see now, the challenge of cycling from Toronto to New York is all about making sure you are adequately prepared and that you are going to be capable of making systematic change stick. The journey will be taxing and it will be exhausting at times; you’ll push yourself further and further beyond your own limits every day. The challenge, though, is rewarded in what you will experience throughout the journey. Unique views, interesting perspectives, and fresh visions will engulf what you do and when you do it, and thus the challenge of riding to New York will become more of a reward and an interesting path to follow than any kind of challenge or excessive journey. I want to hear how you get on! The idea of reading and learning about other experiences sounds fantastic to me, and the ability to see how much you learned from my own journey will be really interesting. Don’t hesitate to get in touch with me to start talking about how to enjoy the journey or even the progress of your own journey – just remember; cycling is all about having fun and experiencing something new, so be sure to really embrace everything it introduces! Don’t forget to do your Bike Yoga at the end of each day – that will keep your trip enjoyable. Get my Bike Yoga app today.